* Synchrony 12 Months No Interest Financing Equal Monthly Pay plus any applicable taxes. Apply online. Transaction Code 112 Synchrony will advise you of your maximum amount or full credit that you can use towards purchase. 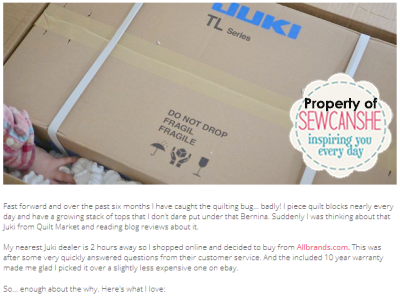 "My Juki 2010 makes me feel so confident starting quilts because piecing is so much faster and more accurate now. 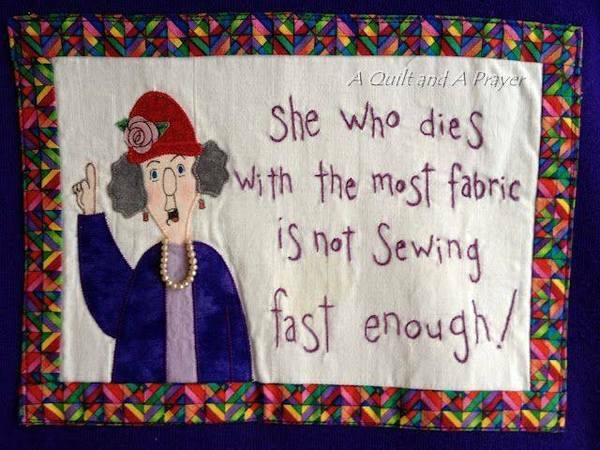 And I can quilt them myself without fear! I am so, so happy about that. My nearest Juki dealer is 2 hours away so I shopped online and decided to buy from Allbrands.com. This was after some very quickly answered questions from their customer service. And the included 10 year warranty made me glad I picked it over a slightly less expensive one on ebay." Same as Juki TL98 +1 Pedal Trim + Speed Control On Board. 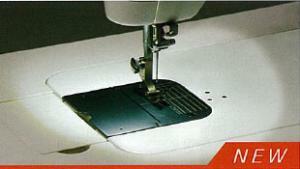 Be sure to use your toes on the foot control to run the machine and your heel to activate the thread trimmer. 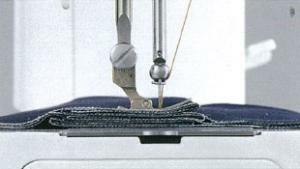 If you use try to use your heel to run the machine, it will only activate the thread trimmer and not run the machine. John Douthat, Owner & Tech, AllBrands. 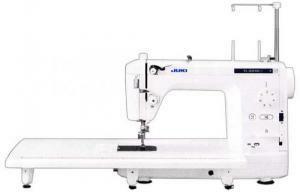 The New Juki TL2010Q is a Single Needle Lockstitch Machine for straight stitching and quilting is also perfect for tailoring, dressmaking and home decor items. 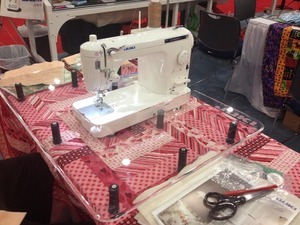 The Juki TL2010Q can be used as a table top machine, mounted into some cabinets or used on machine quilting frames. 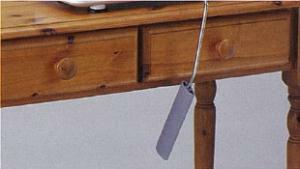 It is portable and has a built in carrying handle. Sewing area extension shown in picture is included with the machine. 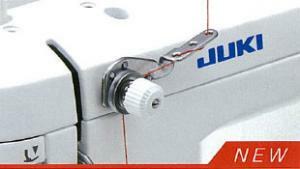 The Juki TL-2010Q is a high-performance sewing and quilting machine. The TL-2010Q is a single needle, lock-stitch, portable machine, constructed of aluminum die-casting to ensure industrial-quality sewing. *With advanced features, such an industrial sub-tension system, *variable speed control slider, and bright white LED lighting, this machine is built for precision sewing. With a large work area of up to 23 inches (with auxiliary table attached), the TL-2000Qi can handle large quilt, sewing or home decor project with ease. 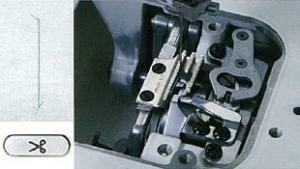 Two typed of quilting feet are supplied as standard accessories with the machine. 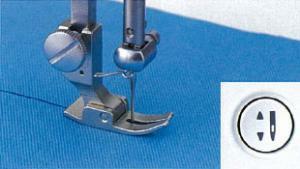 A 1/5 Quilting Foot is used for basic quilting and the Quilting Foot for precision sewing with 1/4" inch stitch width. The feed dog can be raised and lowered simply by depressing a switch. When quilting, the drop feed allows you to sew curved stitches with ease. With its reliable feed, the even feed foot ensures the machine's ability to produce beautiful seams when sewing difficult-to-feed fabrics such as georgette and velvet, as well as heavy weight materials such as leather. The throat size from the needle to inside the machine is 8.5 inches. JUKI TL Series - Chapter 1: Set Up. Welcome to chapter 1 of the TL-18QVP instructional video series. In this video, we will teach you how to set up and operate your machine. Quilting Ruler Foot and Template Set. This video is about the Westalee Designs Ruler Foot and Template Set Demo Project Offer. Information applies to all ruler feet and optional templates. Manufacturer's US warranty 5 Years Mechanical, 2 Years Electrical, 90 Days Adjustments on defects in material or workmanship. 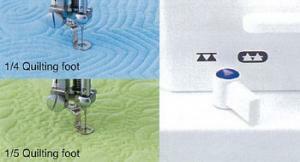 1/5 inch Quilt (Also called "Free Motion" Darning Feet) Foot Walking Foot, 1/4" Seam Compensating Foot, Rolled Hem Foot, Zipper Foot, Foot Control, Power Cord, Instruction Manual. NO 1/5 inch Quilt (Also called "Free Motion" Darning Feet) Foot* is no longer included. NO Compensating Foot* is no longer included. NO Rolled Hem Foot* is no longer included. Foot Controller with Thread Trimming Function It is possible to automatically trim both needle and bobbin threads by pressing the heel side of foot controller. 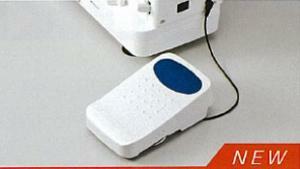 The foot controller is big enough and it is easy to control sewing start and stop. Sub Tension Unit Even if strongly twisted thread should be used, the unit will avoid "return of twist of thread" and supply needle thread to the main tension unit without thread quivering. It helps sewers create sttiches with stable thread tension. Automatic Thread Trimmer The machine is equipped with an automatic thread trimmer device that simultaneously trims the needle and bobbin threads at the sewing end by lightly pressing the push-button. It uses the thread trimming mechanism. Even Feed Foot With its reliable feed, the even feed foot ensures the machine's ability to produce beautiful seams when sewing difficult-to-feed fabrics such as georgette and velvets, as well as heavy weight materials such as leather. Heavy Weight Materials are Sewn with Ease The speed control mechanism, operated by microcomputer, allows the machine to sew materials at low speeds. This provides for accurate feed and perfect stitching when sewing heavy weight fabric, quilting and multiple layers of materials. Maximum Sewing Speed Control Now you can control maximum sewing speed within the range from 200 to 1,500 SPM with this slide knob. This ideal for free motion quilting. Predetermined Stop Position of the Needle When you stop sewing, the machine will come to an accurate stop with the needle down. To move the needle up or down as desired, simply press the needle up/down button. 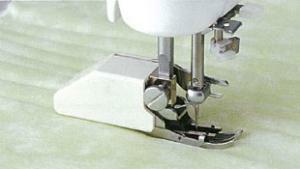 Two Types of Quilting Foot/Drop Feed The quilting feet are designed for free motion quilting and free-hand embroidery. 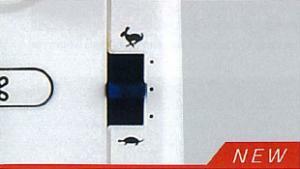 The feed dog can be raised and lowered simply by depressing a switch. When quilting, the drop feed allows you to sew curved stitches with ease. Thread Tension Scale The machine is provided with the thread tension scale, which allows you to adjust the tension according to the thread and material to be used. Adjustment of Presser Foot Pressure Presser foot pressure can be adjusted according to the fabric being sewn by turning a regulator located on the top of the machine. CLEANING: Use only 100% cotton towel to clean surface of acrylic. damages, misuse, abuse, accidental or the like, or commercial use. products may work, but use at your own risk. and crack. If harsh solvents are used on acrylic the warranty is void. RETURNS: Contact the original place of purchase for return policy. date for no charge replacements. Dream World Northwest warrants this product, to the original owner.